The current issue of National Geographic has a feature about Paul Salopek, a journalist who is retracing the steps of the first human migrations around the world. He’s doing it all on foot (and, where necessary, by boat). Salopek’s journey, called the Out of Eden Walk, started in Ethiopia, where the oldest human remains have been found. As the route below shows, he is traveling North, across the Red Sea to Saudi Arabia, and up through Jordan and Lebanon to Turkey. From there, he heads east through central Asia, passing through India and China, and then turns north into Russia. Next he travels by boat to Alaska, following the route taken by humans 12,000 years ago when a land bridge connected Russia and Alaska. Finally, Salopek travels south through the entire length of the Americas, until he reaches the southernmost tip of South America, which is Tierra Del Fuego in Chile. In all, it will be a 7 year journey. Salopek is not just taking a very long walk. Everywhere he goes, he is meeting the people and learning about their life experiences. He is taking pictures, visiting ancient sites, and blogging regularly as he goes along. His latest stop is at the Al Zureb Fortress in Saudi Arabia, and he has blogged about the historical significance of the site and its connection with Lawrence of Arabia. You can track Salopek’s progress and see his blog here: http://outofedenwalk.nationalgeographic.com/ and check out an interactive map of the entire route here: http://www.outofedenwalk.com/map-room/. The Out of Eden Walk is an incredibly ambitious goal, which will take a great deal of perseverance to traverse such a wide variety of climates and cultures. I wish him the best of luck as he follows in the footsteps of our ancient ancestors. “I wanna hang a map of the world in my house. Then I’m gonna put pins into all the locations that I’ve traveled to. But first, I’m gonna have to travel to the top two corners of the map so it won’t fall down.” – Mitch Hedberg. 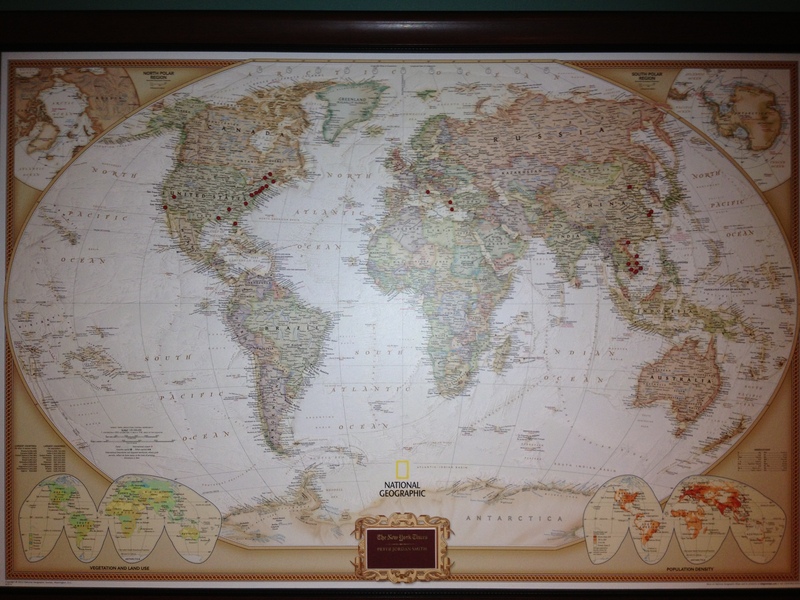 For Christmas, I received a wonderful world map from my aunt. It was made by National Geographic and came engraved with my name and a set of pins for charting places I had been in the world. I immediately opened the package and began putting pins in the map. I had been proud of the fact that I had visited 8 countries and a dozen or so states in the U.S., but after looking at the map, I realized that there are still an awful lot of places I have yet to see. Maps not only make the world seem smaller by putting all places together on one plane, but they make it bigger, by revealing the sheer scale of the physical world. I rode in a van across the U.S.-Mexico border from San Diego to Tijuana, and I remember it taking at least a couple hours. But on this map, the two cities are so close together that I can only fit one pin there. Anyway, here is a picture of my world map with the places I’ve been. So far my international travel has mostly been limited to southern Europe and east and southeast Asia. Africa and South America are completely bare, but I’ll get there someday. And all those islands in the Pacific are just calling my name. But for now, I’ll have to settle for map gazing. Does anyone else have a similar map in their house?